Midfielder Gylfi Sigurdsson does not think Swansea City are safe from relegation from the Premier League. 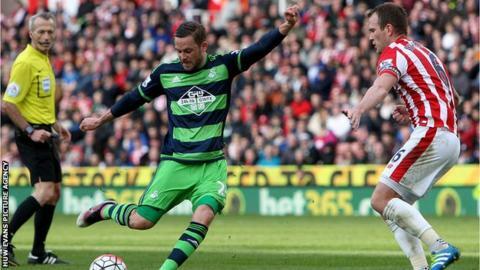 Sigurdsson scored Swansea's first goal as they came from two goals down to secure a draw at Stoke on Saturday. Swansea are 10 points clear of the relegation zone with six games left, but the Iceland international says they cannot be complacent. "You never know how things will pan out. But at the moment we're not feeling too confident," he said. "I think we need a few more points and ideally probably one win would seal it. "It's down to us to make sure that we keep on going and try to pick up as many points as we can and make sure by 15 May we are safe. "There's going to be some crucial games in the next few weeks." Head coach Francesco Guidolin also insists Swansea are not yet safe, but says three more points will probably secure top-flight status. Top-scorer Sigurdsson said the introduction of winger Jefferson Montero as a second-half substitute was a game-changer against Stoke. "On his day, when he's playing his best football, he's pretty much unstoppable with his speed," Sigurdsson added. "It's easy for me and the striker just to try to time the run and get on the end of the crosses. "We know nine times out of 10 he's going to get the ball into the box and it's just a matter of if we're going to get to the end of it or not."